Almost finished with Route 66! Was on the road by 6:30 from Flagstaff, then paused for munchies in Williams before starting the 160-mile Interstate-free loop across Arizona. 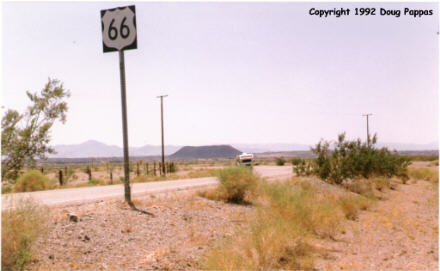 The road's only occasionally marked as Route 66, and I encountered little traffic. 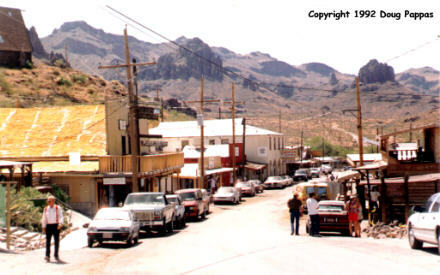 In Oatman, I found a treasure trove of new humorous postcards drawn by a local artist; also picked up a paperweight made of Lucite-covered animal dung, captioned "Bush's Domestic Policy." I continued down to Topock over a road that's 80% resurfaced since Tom Snyder's Route 66 book warned about the dangerous conditions, then crossed the Colorado River into Needles. A few miles outside of Needles, the National Old Trails Highway breaks off from I-40. Except for a few miles near Barstow, I'd stay on this path, which predates even Route 66 by several years, almost all the way to San Bernardino. The road parallels the main Santa Fe line, which provided all the human activity visible anywhere along this path. Amboy also boasts a volcanic crater and lots of ash. Found 16 more postcards at Barstow, then turned west at San Bernardino, past the Wigwam Village with "Do It in a Wigwam" sign (which still looks better than I'd feared, and seems to be under new ownership), before giving up around Upland and taking I-10 to Steve G.'s place.